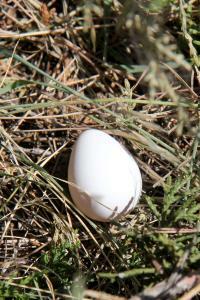 This egg was laying alongside a portion of the Red Dam Loop. It was undamaged but there was no nest nearby. I suspect another bird raided the nest and dropped it. Temps in the mid 80's to start and mid 90's at end, steady breeze and sunny. Fitness hike with a friend. Not much to report but to repeat the trails are being worked on but they still need more work; especially the last section of Tasajilla Flats. Of interest, found a bird egg (photo attached) laying next to the trail with no nest near by - I believe it is a house finch egg. Don't think it will hatch but you never know.